We have been so proud of the images and comments coming back to us lately from happy Rent What? clients who have used our striking rental drapes for their special events, concerts, and tours. Our theatrical curtains are all easy to hang, easy to ship, and are absolutely outstanding with reflecting colorful lighting–which can better help create unique and gorgeous one-of-a-kind looks for all kinds of stage designs. Recently we were thrilled to work with the incredible Lighting Designer Tyler Trofatter, with Trofatter Productions. 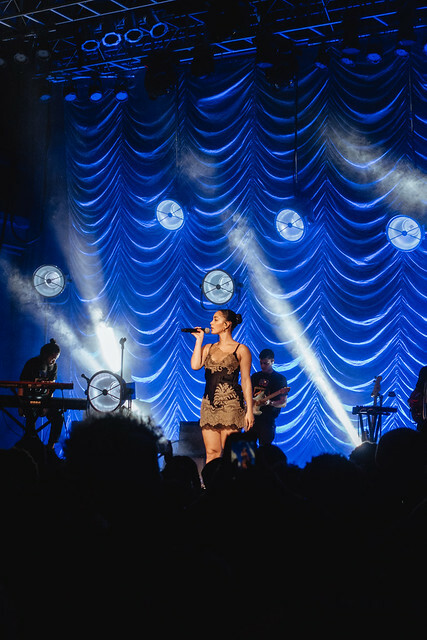 He needed some breathtaking, yet versatile, rental drapes that he and his lighting director Matthew Kemp could impeccably light up on a leg of Jorja Smith’s much-anticipated–and smash success–national tour. Known for her charming–yet complexly vibrant–songs, they didn’t want to build a stage design that would be overly extravagant. Tyler and the exceptionally talented lighting team at HSL strived to have this up-and-coming young songstress’s enraptured audiences be able to fully hear and absorb the words and the music coming from the songs themselves, and not be distracted by a lot of “muss and fuss” onstage. But they still wanted to create a beautiful, picturesque background for this soulful and sultry powerhouse to sing in front of, too. They would require rental drapes that could fit in various sized concert halls, but still needed something that they would look magnificent in and of themselves, too. Choosing 30’h x 16’w Cloud Satin Austrian Zip-Wall Curtains (from our Silver Satin Rental Drapery Collection), they could zip together as many–or as few–as they needed to create the backdrop necessary for that particular stage’s dimensions. 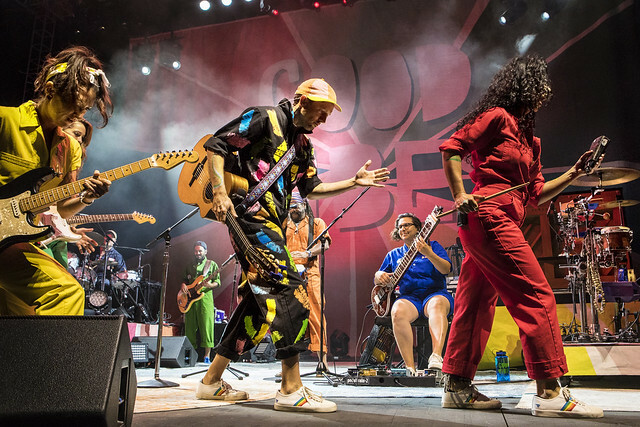 As you can see by these amazing photos (taken by some supremely gifted tour photographers), they did a truly sensational job with the show’s entire motif! The fantastic staging, the perfectly added décor, the dazzling RW drapes, the stunning theatrical lighting…they all lent to fashioning a genuinely spectacular tour design not soon forgotten by Smith’s excited audiences all over the country. Let our team of drapery experts help provide you with some of our exquisite rental OR custom-made theatrical curtains for your upcoming special event, concert, or production, too. 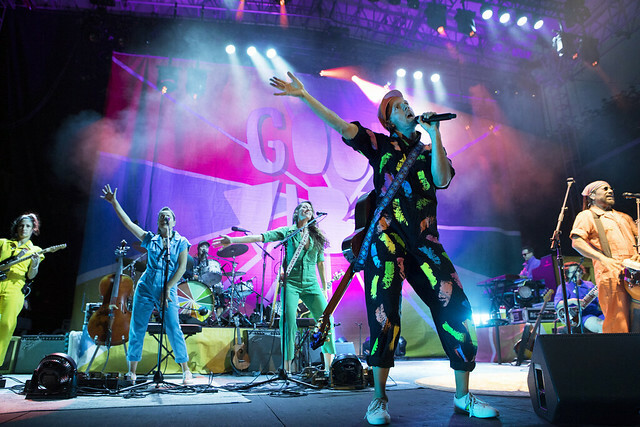 We love when we get to help our clients create create a one-of-a-kind experience for the adoring fans of their band or artist, by building them custom-made theatrical drapes–which can then be enjoyed throughout the entire duration of their tour or production. 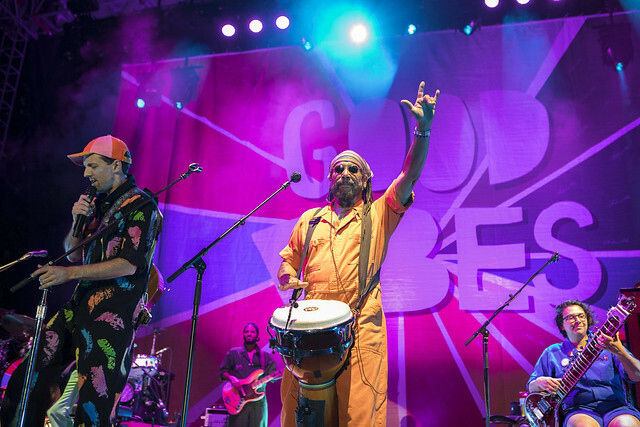 A splash of vibrant color is often a very effective way to really grab the audience’s attention, and custom digitally-printed drapes and stage skirts are a fantastic method of adding an array of exciting colors to your own unique stage or event design. 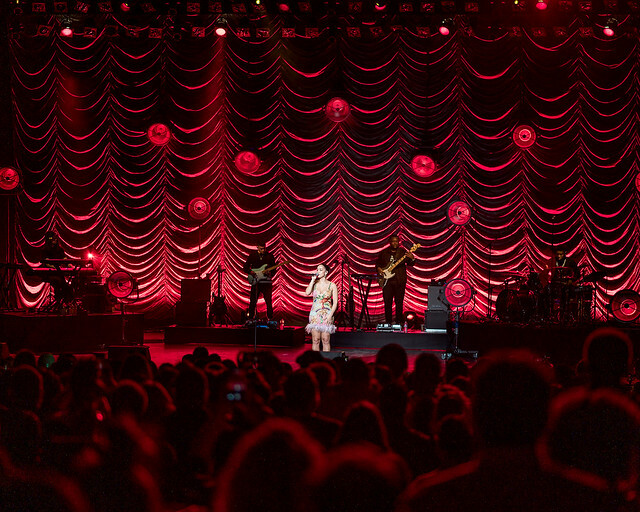 With spot-on advice from Shane, ET decided to have us custom-build the tour some beautiful stage curtains out of our digitally-printed IFR Vinyl Mesh. This 25% blow-through (“wind transmission”) substrate is the perfect option when you are looking for a polyester coated material that will offer excellent color accuracy and high quality durability, and yet still be weather resistant. Tours love this direct-print digital substrate because it is lightweight, has low wind flow resistance, and yet still offers crisp image details and a truly brilliant color display. As you can see, these drapes were the perfect background for these cheerful, upbeat performers at both indoor concert halls and outdoor arenas. Check out our new Flickr Gallery to see a collection of exceptional photos of these distinctive and vivacious digitally printed stage drapes, taken by a couple very talented photographers across the country. We strive to provide our clients with memorable stage curtains for all of their special stage designs, and were thrilled with how eye-catching these drapes turned out. Contact a sales rep today and let us help you create a completely original look for your design, too. 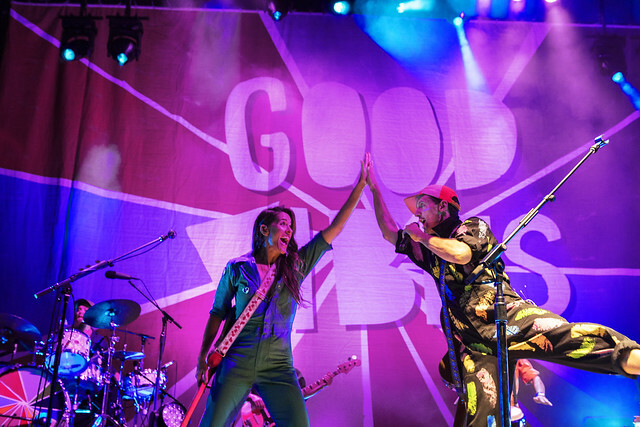 We highly recommend that you try and catch Jason Mraz’s Good Vibes Tour live in person this summer, too—it’s a fantastic, exhilarating show filled with Jason’s honeyed voice and an incredibly talented band of musicians and back-up singers. It’s an unforgettable, feel-good show that the entire family will enjoy! So she decided it would be fun to create a sign in the front window facing both those entering and those leaving the building, showing everyone that it is completely normal for this cute and charming squirrel to be hanging around so close by. And as you can see by the photo, Trixie even allows a few fortunate individuals to hand feed her…and this sign shows that Trixie and her friends are all actually officially part of the SW Family now, too. So now when people come through our main front door, they are both intrigued and excited to see that this friendly squirrel is formally the head of our welcoming committee. And that she is also usually very happy to accept a small “bribe” from most of these delighted folks, too (in the form of tasty peanuts—always two at a time!). It seems like only yesterday that I published the very first post on our company’s brand new blog, but amazingly enough, it was ten years ago, on March 24, 2009. In the beginning, I was not only the blog administrator, but also the primary author of posts, with Megan contributing as well. I was learning as I went along, so the early posts were mainly text with the occasional photo. As the years went on, this blog evolved. As I became more comfortable with the WordPress platform and other platforms like Flickr and YouTube, we began to include more embedded content – including YouTube videos and Flickr photos of our custom stage drapes and rental stage curtains out on tour. Over the years, the voice of the blog has become more diverse, as a variety of staff members have contributed posts. Some have contributed just one or two posts, while others have became regular and frequent authors. Today, blog posts are primarily written by Marianne, Megan and me (though my focus these days is more on administering the blog rather than writing posts). It is just so amazing and gratifying to see how this blog has evolved and improved over the years. Whow would have imagined when we launched this new unfamiliar format ten years ago that the blog would still be going strong in 2019! Thank you to all of our readers and contributors – here’s to another ten years! It’s always very exciting to work with our super-artistic clients who are envisioning a stage or production design using our rental drapes and soft goods in unique and innovative ways. This helps them produce a completely one-of-a-kind, memorable look for their own special event that has never been seen before. To help them achieve their design goals, we were delighted to provide them with a handful of our gorgeous 40’h Silver Satin Legs from our Silver Satin Rental Collection. They were able to swag these taller-than-average shirred drapes horizontally and then clamp them onto the truss bar directly—creating a truly distinctive background for the event’s special presenters and speakers. Adding some eye-catching and colorful theatrical lighting to these curtains, they were able to create a fresh, new motif for each individual portion of the meeting. Easy to hang, easy to ship, and utterly spectacular to light up, drapes from our luminous Silver Satin Collection are a surefire crowd-pleaser! Photographed beautifully by Jerry Hymer, you can see that, by simply changing the color of lighting being splashed onto these drapes, Nathan and his lighting designers were able to give this event’s staging an absolutely resplendent appearance. Let our experienced sales reps help provide you with the drapery elements you need to build the remarkable event or production design that you are envisioning, too—contact one of them today!